In the spirit of ecumenism and fellowship, we are often asked about our rapport with other religious confessions present in Sicily. In practice, the primary mission of the Holy Orthodox Church is propagation of the Word of God, and living that Word daily as Christians. "Ecumenism" is not our primary mission. That said, here is a brief socio-historical outline regarding the position of the Orthodox Church in Sicily and some other faiths. Islam was practised in Sicily from the ninth century. It flourished under the Normans but was gradually suppressed until, by 1300, there were few if any practising Muslims left here. Initially, most Muslims were Arab. The Muslim influence in Sicilian society cannot be overlooked. 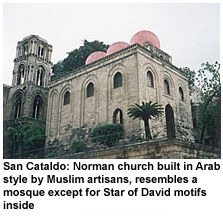 It is still evident in many Sicilian social practices and, physically, in the "Norman-Arab" architecture of Palermo and much of Sicily, including many churches. Today, with the influx of immigrants from northern Africa, Sicily has seen an increase in the Muslim presence. There are rather few Muslims in Sicily who are native Italians. In many Arab (and predominantly Muslim) countries, particularly in the Middle East, the Orthodox Church has existed alongside Islam for many centuries --usually peacefully. The two Faiths are completely separate theologically, sharing few precepts in common, but there need not be antipathy between them. Jewish congregations existed in Sicily from Roman times, but were suppressed during Spanish rule in 1492. It is difficult to estimate the number of Jews present in medieval Sicily, but they may have accounted for six or eight percent of the population as recently as 1200. Today, except for a small number of immigrants and resident foreigners, there are very few Jews in Sicily, Italy's largest Jewish communities being found in Rome, Florence and Venice. Traditionally, the Jews, like the Muslims, have coexisted peacefully alongside the Orthodox. Orthodoxy shares little with Buddhism, but the right of Buddhists (and others) to practice their philosophy is strongly defended. In a global context, this includes the rights of Buddhists in Tibet and other regions of China. In Italy, most Buddhists look to the Dalai Lama as their spiritual leader, and he has visited Palermo twice. He is acknowledged by many Orthodox Christians as the legitimate, if exiled, leader of Tibet. The church of England was established in Sicily during the nineteenth century by several English families involved in the Marsala wine industry. In Palermo, the Whitakers built the island's largest Anglican Church in Via Roma. In September 2001, Bishop Lorenzo celebrated (with the participation of the Anglican pastor) at the Church of the Holy Cross a prayer service in memory of the victims of the World Trade Center attacks in New York. The Waldensians may be considered the first Protestants, and though they have been present in Piedmont (in northern Italy) since the middle ages, their Sicilian congregations have only existed since the nineteenth century. Sicily's growing Evangelical movement includes Pentecostals, Baptists, Mennonites and others. Some of these congregations are quite large, and most consist of Italians who were formerly Roman Catholic. Our diocese has occasional contact with these groups. In Sicily, the Albanian communities established by emigres (refugees from the Ottoman expansion into the Balkans) in the late 1400s were composed of Orthodox Christians. By that time, Sicily was almost exclusively Roman Catholic. Within a few decades, these Albanian parishes were "Uniate." In other words, they were Roman Catholic congregations under the pope. As the Byzantine liturgy was retained, the Albanian Catholics "seem" Orthodox externally, especially because their churches, icons, vestments and other features are almost identical to those of the Orthodox. The defining point here is that, regardless of its historical or liturgical traditions or practices, a diocese under Papal (Vatican) authority is not Orthodox, it is Roman Catholic, and follows Roman Catholic doctrine. Today, the Byzantine Catholics in Sicily sometimes claim to be Orthodox. In fact, their main church (the medieval Martorana in central Palermo), though decorated with splendid mosaic icons and considered as "Orthodox" during Norman rule early in the twelfth century, was given to the Diocese of Piana degli Albanesi only a few decades ago. The diocese of the Albanian Catholics in Sicily has no direct historical continuity from the island's medieval Orthodox community. The Norman era (1061-1200) witnessed a gradual but deliberate Latinisation of Sicily's Christians, who previously had been Orthodox. This occurred in the wake of the Great Schism (1054). By 1300, very few "Byzantine" churches remained, and most were associated with monasteries in north-eastern Sicily (the Nebrodi Mountains). Naturally, the Orthodox Church seeks a good rapport with other Christian denominations. The concordat signed in 1984 between the Vatican and the Italian Republic established Italy as a secular state with no official religion, though in many Italian quarters a strong Catholic influence remains. Today, a minority of Italians are practising Catholics. For the Catholic hierarchy, the Orthodox pose a historical and theological challenge because, while the Protestant churches obviously broke away from the Roman Church, the Orthodox Church has existed since the very inception of Christianity, flourishing in Greece, the Holy Land and eastern Europe long after the Schism. Thus Orthodox orders (i.e. episcopal consecrations and sacraments) are recognised as canonical by the Roman Catholic Church, though Catholic canon law is of no concern to the Orthodox themselves. One might expect the Orthodox and Catholic churches to be fairly close, and in some countries they co-exist well in a spirit of friendship, but in Italy --sadly-- this is far from the case. The Catholic hierarchy in Sicily (even the Cardinal Archbishop of Palermo) often disparage the Orthodox clergy. While the Byzantine Rite Catholics (see above) occasionally --and inaccurately-- claim to be the "true Orthodox in Sicily," their Latin Rite brethren sometimes attempt to arrogate to themselves the "right" to decide (one wonders for whom) who is canonically or "genuinely" Orthodox. Often, they favour one Orthodox jurisdiction (typically Constantinople) over another. "Divide et impera" seems to be their approach, though in practice it is rarely successful. This unofficial but prevalent Italian Catholic perspective reflects longstanding attitudes and a peculiar ethnocentric view that "all Italians should be Catholic." Such a position ignores Sicily's multicultural (and multi-faith) history while embracing certain nationalist (and even quasi-Fascist) ideas which overlook the fact that Italy's oldest religious congregation is not Catholic or even Orthodox, but Jewish. It also runs contrary to the principle of free practice of religion guaranteed under Italian law. Understandably, in view of this most unfortunate situation, the Achdiocese of Italy of the Ukrainian Autocephalous Orthodox Church does not participate in "ecumenical" (inter-faith) activities sponsored by the Roman Catholic Archdiocese of Palermo.